Maria Komissarova heads to a clinic in Munich that specializes in spine injuries. SOCHI, Russia — Olympic skicross racer Maria Komissarova was airlifted to Germany for further treatment after surgery on her fractured spine, the Russian freestyle ski federation said Sunday. The 23-year-old Komissarova crashed during a training run Saturday, fracturing the 12th dorsal vertebrae in her lower-middle back, and underwent emergency surgery lasting 6 1/2 hours. A team of specialists inserted a metal implant in Komissarova’s spine in a successful operation, the federation said, though they declined to discuss the skier’s prognosis. Komissarova was listed as being in a “grave but stable” earlier Sunday, on a day when two women’s snowboardcross riders were carried off on stretchers after bad falls. The IOC said it had no concerns over the course conditions and maintained that there have been no more crashes and injuries than in previous Winter Games. Russian President Vladimir Putin visited Komissarova in the hospital on Saturday night. 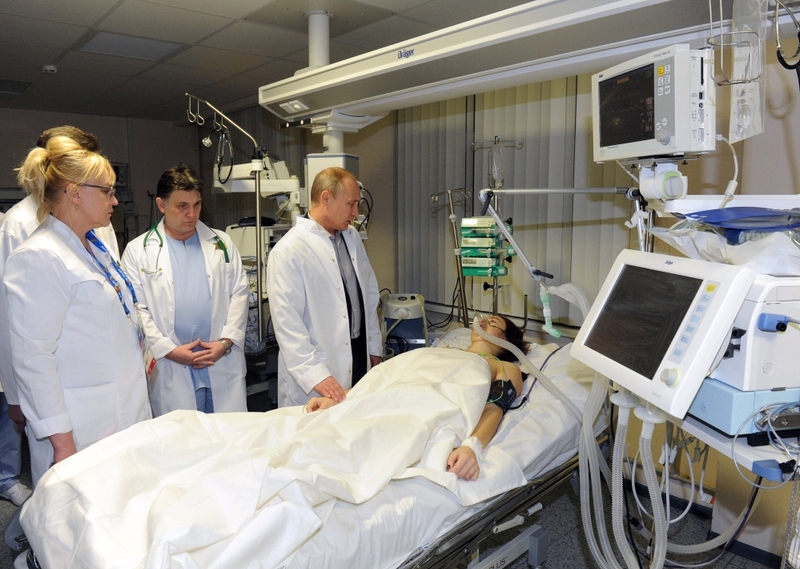 Photographs and television footage showed Putin at her bedside, wearing a white hospital coat and holding her right arm. Komissarova was heard speaking to him. Medical staff briefed Putin on the surgery and further treatment, and the president “wished her a speedy recovery,” the statement said. Jenny Wiedeke, spokeswoman for the International Ski Federation, said the accident occurred on a series of jumps near the top of the course and Komissarova fell while exiting the third jump. Adams was asked whether the course or conditions played a role in the crash. In women’s qualifying Sunday, Jackie Hernandez of the United States was knocked unconscious after slamming her head into the snow. She briefly sat up after several minutes and was communicating with medics before being transported down the mountain. The crash came minutes after Helene Olafsen of Norway also was taken off the course with what appeared to be a knee injury.